is anyone here able to get evernote notes into Scrivener? the way I'm reading from a few different resources that I SHOULD be able to do it, well, those methods aren't working. I have found a way to do it by first exporting the evernote note, then going into the resulting folder and if it's a web clipping, dragging the html file into scrivener, or if a PDF, then dragging the PDF itself. But that's really a kludgy way to do this. Anyone have a simple, elegant way to get stuff from evernote into Scrivener? They're two awesome apps, was hoping they'd play better together than this. I just tried using the import webpage with an evernote link and it worked fine. However if I leave that note and come back I get a spinning icon with only the evernote logo and the title of the note. Usually I just use copy and past to get notes into other apps. Command A to select everything in the note, Command C to copy, switch app, Command V to paste. Hi. I am not aware of any simple method (besides manual copy/ paste). Your kludgy method sounds like what I have done in the past. They are totally different beasts. I can see why you would want them to communicate better, but I doubt that will happen, because it would require Scrivener to build an integration with Evernote's API into the app, or a third party to build a separate app to bridge the gap. yeah, I suspect copy and paste is probably the best way to go here. It's disappointing to me that Scrivener doesn't well-handle Evernote note links. Can't even add them as a reference item in the Reference pane. Well, you can, but Scrivener doesn't know what to do with them. ok, played around with it a bit more and have just a wee bit more info. Basically, copy and paste is the most reliable method for getting stuff in. If the evernote note is simply some file like a PDF or JPG or MP4, you can also click and drag the file itself directly into Scrivener. If it's a web clipping, you can copy and paste, or instead of what I was trying to do using the note link, you can click 'share' and then select a public weblink from that menu, then import a webpage into Scrivener using that link and that will import the page. So it's possible. Would be great if at some point there was tighter integration between the two apps. I don't really use the references but I was able to get bot old and new style links to work by using "Create External Reference", new style opens the note in a browser and old style opens in a new EN window, maybe not exactly what you were looking for but could still be handy..
A couple of questions. First, I'm not sure what you mean by old and new style links. Can you clarify that for me, please? My experience is if I go to the item in Evernote and do share/create public link, then go to Scrivener and 'create external reference', if I just copy the public URL into that reference item and save it, then double click to use it, I get an error message that scrivener can't open it. But if I take that public link, add a new tab to my browser and open it there, then drag the url to the reference column directly, then it works. It opens it in a browser window. I'm interested in what you did to get a note to open from Scrivener within the Evernote app. And are you on a Mac or PC? Those are for the same note. You can right click the note and choose "Copy Note Link" too get the new style one, or right click and then press option at which time "Copy Note Link" will change to "Copy Classic Note Link" and click that to get the old style one. The difference is the first one will open the note in a web browser, the second "classic" will open in the Evernote app. Note: I had to put some spaces in the first link because I couln't figure out how to keep the forum from actually making a hyperlink which then made the text abbreviated. thanks Jim, that's interesting. Had no idea about holding down option to get the classic link. just tested and it works great in OmniFocus. But, Scrivener doesn't know what to do with it. If I put it in the reference section using 'create external link' and then try to open it, I get an error message, "Reference could not be opened from specified URL". Just tried it on a page that was a web capture into Evernote, no joy. Tried copying and pasting it, that gets the content in there but the formatting is all broken. Tried exporting the note and then adding the html file, that just brings up a blank page, it's not seeing any of the resources needed to populate the page. Scrivener is a terrific application, just wish its developer would add tighter Evernote integration. These two apps could be so awesome together. Sorry forgot to addressthis part in last post. I don't make a public link I just copy the note link. In the Snippets view I click the note snippet and right click (Control Click if you have one button mouse) I choose either "Copy Note Link" or "Copy Classic Note Link" as I taked about in the above reply. The "Classic" link is the one that will open in Evernote. Jim, thank you very much for that. I was doing everything you were doing with one exception. For whatever reason, the URL field in the reference section was basically at 0 points of width so all that displayed was the description field, but the way the fields were set I couldn't even tell that's what that was. I'd never worked with this section before, so I was copying the note link into the description field, not the URL field. Oops. I'm looking at your video going "yeah, I did that. Yep, did that too. Wait, my reference field doesn't look like that." Rearranged it, input the note link properly and now it works beautifully. Love finding the classic link option so that I can get notes in all apps opening directly in Evernote instead of going through the browser. That's really cool. I'm using that now when I link Evernote items in any other app, especially OmniFocus. the most important point here from my experience is that the best method depends on what is being imported into Scrivener. Different source types require different import methods. If the media type is an imported file, like a PDF, JPG, MP3, MP4, etc...., then in the Evernote note, click on the file name within the note and drag that file directly into Scrivener. Now, if your Evernote note has both a file like this AND text you wrote in the same note, this method will not import the text you wrote. You'll have to copy and paste that separately. In my tests, selecting All and then copying and pasting did not bring over the file, just the text. If the media type is something you either typed directly into Evernote, or copied and pasted into Evernote, then copy and paste the note contents into Scrivener. You can also use the 'share a public link' method, but that creates an item that Scrivener has to read through the Evernote website, and that seems to work unreliably. Sometimes it displays the note in Scrivener right away, sometimes it seems to spin for awhile before it displays it. Copy and pasting it will avoid this, obviously. At this point, this is what I've figured to be my best options for getting different types of material out of Evernote and into Scrivener. If anyone has a better way for anything, or if I've got something wrong, please let me know. And Jim, thank you again for going to the trouble to respond above, that was very helpful and I appreciate the time you took to help me out. 3. Open Safari and past the link into the address bar, you do not have to press enter just paste it in. This makes a .inetloc file which is more or less just a shortcut. This thread seems a little old, but it's still relevant to what I'm trying to do. 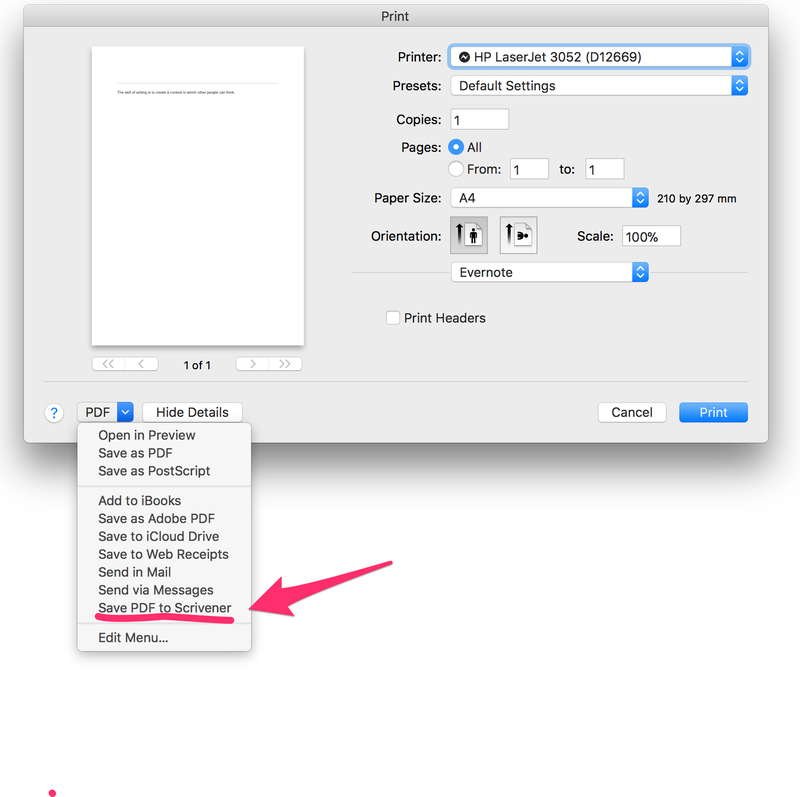 I've noticed on my Mac native Evernote App a print/pdf option to Save PDF to Scrivener. Apparently, you need to have the Research folder selected in an open Scrivener project for this to work. I've just upgraded to Scrivener v3 (love it), but this doesn't work. Anyone got an idea on this? yeah, I was finally able to use that method, as well. Just upgraded to Scrivener 3 but haven't had the chance to use it at all yet. Bummer if this doesn't work right now. Can you provide details on how this isn't working? Note: This isn't an Evernote provided feature. You should be talking to the Scrivener people.